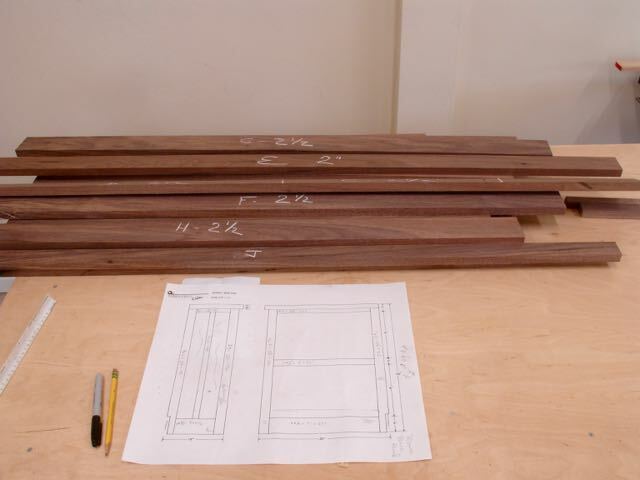 I’ve recently begun work on a solid Walnut bookcase for a client. It will be located at the top of the stairs in their home and needs to be sturdy enough to hold various large and heavy books they own. Unfortunately, some of the shelves they already have that are your typical laminated MDF variety are beginning to sag under the books weight — not good! My plan is to use 3/4″ furniture grade Walnut plywood for the shelves, back, and the one side that goes against the wall; the remainder of it will be solid 4/4 and 6/4 Walnut I’ve purchased from Woodworkers Source here in Phoenix. The shelves are about 13″+ wide and 30″ long, my first thought was to double them up but decided a rim glued and screwed around the perimeter will be even stronger and prevent any sagging. The top will be 15″ wide and the first thought I had was to laminate 4/4 stock together and then band it. As I was selecting the wood I couldn’t find two pieces that were wide enough to create that top — lots of sap wood. Well, as luck would have it there was a stack of wide and sap free 6/4 material next to it. As the maker it’s up to me to come up with the best solution and although it meant a bit more money and time I decided I’d rather have a beautiful, solid top, in our discussions the client mentioned it would be nice to have a “showy” piece so hopefully; this will meet their needs. To prepare the edges for laminating I check not only with a try square and straight edge but also set the boards on edge and check that their faces are level with a long straight edge (picture 1). Another trick is to rotate them when stacked and feel resistance indicating even contact (picture 2). For glue ups I always use Gorilla Glue and these old panel clamps (picture 3), if the ooze line is uniform that usually indicates a good joint. Finally, before bringing this piece to width a block plane and even the smooth plane was used to polish the end grain that will be visible (picture 4). Most of us woodworkers have our own strategies, mine is to draw out the plans by hand (old school) then label each part. When it comes to the joinery my preference is to draw it out full size on 1/4″ square graph paper. Here I can accurately measure tenon width, mortise depth, and any rabbets and tongues plus add the tenon length to the pieces that need it. Once the pieces are roughed out the exact sizes are noted on the plans and each piece is marked with chalk. At this stage of the game not only are the parts cut to required sizes but all of the mortises are in as well. One last thing that came out better than I’d hoped was to resaw a piece of the 4/4 stock for the two panels for the side of the bookcase, you can see it if you click on the plan picture to enlarge it. 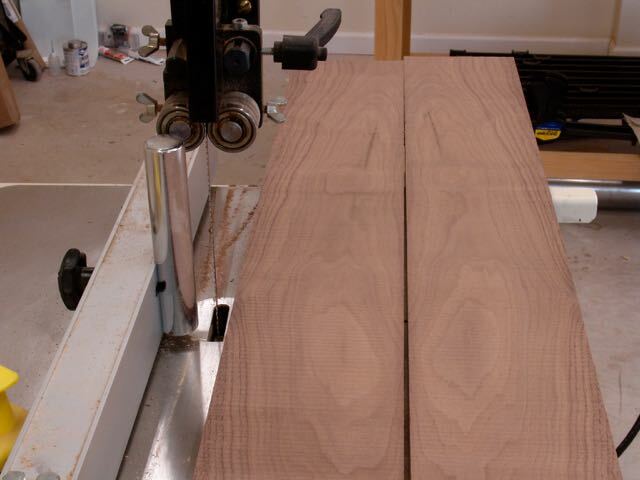 A piece was selected that had some nice cathedral grain but the blade in the bandsaw was the 1/4″ wide one. Not wanting to change it out for a wider blade decided to take a chance and it paid off! Just planed the bottom edge square, drew a line, and used a simple pivot point to guide it, about 5″ x 40″ long. Between the power jointer and then final cleanup with the smooth plane I was able to get two, very nice book matched 1/4″ thick panels for the sides. Have some house work to do first thing tomorrow but then it’s on to cutting the tenons. This entry was posted in custom furniture and tagged book matched, custom bookcase, custom furniture, design, laminating, planning and layout, Resawing, Walnut, Woodworkers Source. Bookmark the permalink.